I'm not referring to the Breakfast Club many of you remember from PU ... I'm referring to the new tradition my family started a month ago - Monthly, Saturday Morning Breakfast. This new tradition simply consists of my mom, dad, sisters and their families, as well as me and my husband meeting at a restaurant, eating good food, laughing a lot and just enjoying our time together. Let me start off by giving a shout out to my wonderful family. I am so blessed to have supportive, loving parents who have always let me be me and have lent their guidance when needed. They have always sacrificed their time and resources to ensure that I had every opportunity in the world to better myself. It doesn't hurt that my dad is hilarious and my mom shares my love for fashion and thrifty shopping! I couldn't ask for better sisters either. They are my best friends ... I know I can also depend on them, and we ALWAYS have a great time together, no matter what we are doing. Throw in the 2 most adorable kids EVER and 2 brother-in-laws that never hesitate to lend a hand and anyone can see how lucky I am! 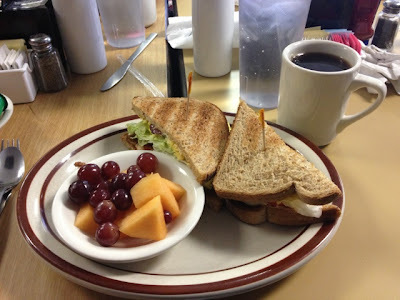 This morning for breakfast we went to Early Bird Pancake House at 86th and Michigan Rd. The food was tasty and the service was great. We were able to hang out for as long as we wanted and put all of our stresses behind us and just be together ... A perfect little Saturday!